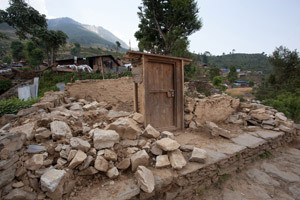 In April/May 2015 two major earthquakes and hundreds of aftershocks caused widespread devastation across central Nepal. This paper explores why there was comparatively less damage to the main historic Newar urban settlements. The Newars are the historical inhabitants of the Kathmandu Valley and its environs in Nepal, who evolved from a mix of Tibeto-Burman and Indo-Aryan ethnicities over thousands of years. Their extraordinary civilisation, language and unique culture exist to the present day. Early Chinese sources suggest that from the early centuries of the 1st millennium C.E., the Valley settlements included a number of prosperous merchant towns and was a cross-roads for an exchange of both culture and merchandise from Tibet and China to the North and India to the South. Under the Licchavis, by the 6th / 7th Century C.E. the Kathmandu Valley was already famous for its architecture and apparently enlightened governance. According to historic records, by this time there were extraordinarily skilled artisans, stone sculptors and bronze casters and buildings of prestige with interlocking courtyards and multiple storeys were already being built on higher land. There is evidence that constructions were being made in brick, wood and dressed stone even then, for example, the 3rd century, C.E. Changu Narayan temple complex. Many historians have assumed that the Newar urban style was largely an attempt to save the more fertile bottomlands of the Kathmandu valley for agriculture by grouping houses together in the higher, dryer and less agriculturally productive areas. Consistent with developments in pre-industrial Europe and the Middle East, such mediaeval patterns of urbanisation could also have been a response to marauders, invaders and antagonistic neighbouring clans; grouping homes, extended families, guilds and religious hierarchies together behind gated town-walls and in elevated positions provided protection. Patan, Bhaktapur and Kathmandu – the three main historical centres of the Kathmandu Valley – were previously separate and wealthy settlements. The large and small courtyard architectural system with adjoining houses facing inwards, interconnecting passages and outside access only from one or two entrances along the sides, may have evolved for the cultural reasons described above. The Sakya and Vajracharya castes in particular put considerable importance on protecting their valuable possessions, their beautiful women and their highly secretive rituals to the gods and goddesses to whom they owed their prosperity. Maybe this type of development came hand in hand with all the other good reasons to build around a courtyard – a place to spread out the chillies to dry, a space to hold Ihi ceremonies and other rites of passage, have large, extended family bhojs (feasts) and celebrate festivals. The question that this paper seeks to address is why was there not more damage to the main Newar urban centres? 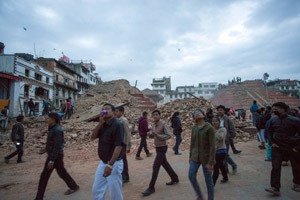 Given the magnitude of the April 2015 earthquake, inevitably this question leads to records of earthquakes in the past and their possible relationship to traditional architectural techniques. Were these dense historic urban cores perhaps constructed to better withstand seismic events? Some 22 serious earthquakes have been recorded striking the Kathmandu Valley over the last 800 years, but with no predictable frequency (see annex 1). This lack of predictability - the fact that such a disaster can happen anywhere and at any time - is sobering, but it is also an incentive to innovate. Nepal is situated on the Eurasian tectonic plate which is being forced upward by the Indian plate; a subduction boundary which is different from all the other plate boundaries – such as in California, Turkey and Iran – where the plates are sliding against one another. This subduction boundary is the only such boundary in the world on dry land; all the other subduction zones are along undersea plate boundaries. Referring to the recorded earthquake event dates (see annex 1), a Newar born in 1808 would have suffered four major catastrophes by the time they were 25 years old and perhaps even seen their house collapse each time. This is the most intense period of major earthquakes in Nepali recorded history but it is highly probable, certain even, that there were many similar short periods of intense earthquakes in unrecorded history. Faced with such unpredictable and sometimes frequent devastation, innovation in structural engineering was inevitable, the inherent risk and the damage caused providing a huge incentive to explore all opportunities to respond to this constant hazard. The theory that this paper would like to suggest here is that the development of this densely crowded urban style of settlement around mutually supporting and connected courtyards, was partly a response to the constant and unpredictable threat of earthquakes. Long before the renowned 6th/7th century C.E. Licchavi constructions, which were the first recorded architectural form in the Kathmandu Valley, when people began settling and farming the valley, it is probable that families - particularly the poorer members of the community – lived in simple, single storeyed houses with perhaps one or two rooms. 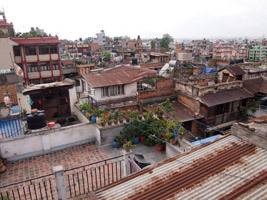 Such houses would probably be similar to a fair proportion of the 600,000 houses destroyed in less than 20 seconds in the 2015 earthquake, namely single storey constructions in kaccha [unbaked] brick or undressed stone and mud mortar with whatever roofing materials which were locally available. These families likely would originally have cultivated the land around their houses and thus would have settled in the fertile bottom-lands around the river systems that drain the Kathmandu Valley until such a time as population increases encouraged a move to the higher and less agriculturally productive areas. 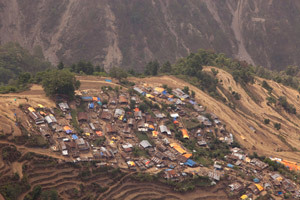 Such a move, away from the agricultural lands, could also be considered as a strategic response to earthquake hazards; moving vulnerable buildings from the poor engineering soils (largely clays) of fertile, agriculturally productive lands to the better engineering soils of the higher lands and ridges in the valley. The earliest valley inhabitants would probably have constructed single storey (and later two storey) stone/mud mortar or brick/mud mortar buildings that stood alone, i.e. were not connected to any other buildings. Initially these buildings would have been in the fields but were perhaps gradually grouped in village-type communities as the population increased and fertile land became scarce. Such villages would have been no different from the villages devastated in 2015. As time moved on, these simple single storeyed houses expanded outwards and upwards depending upon the prosperity of the community. Some Newars would eventually and inevitably notice that those houses where a few extra rooms had been added for an extending family, and particularly where the family household had coalesced into a small square, survived better when devastating earthquakes struck. Structurally, a block of houses with many interconnecting walls has inherently stronger resistance to earthquakes than a single stand-alone building, because such a structure better distributes, absorbs and resists earthquake forces. In effect a stand-alone single or multi-room structure (see Fig. 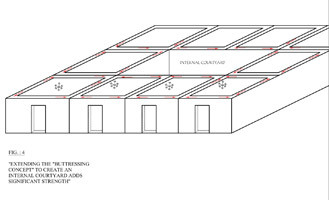 1) has poor response to seismic forces unless there is a continuous ring beam (either reinforced concrete or a timber wall plate) around the top of the walls holding the four peripheral walls of the structure together (see Fig. 2). Without such a ring beam, or, at minimum, strengthening ties at the wall corners, the structure is likely to collapse in an earthquake. 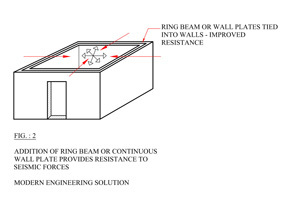 It is for this reason that ring beams on top of walls are standard in all modern seismically engineered buildings. Crucially, adding rooms on one, two or three sides of the original room allows the additional rooms to buttress the original room (see Fig. 3), and of course vice versa. 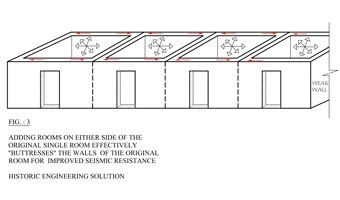 Hence in the absence of the ring beam concept, the addition of rooms either side of the original room provides a solution to the lack of structural resistance in walls that are not tied. Admittedly, this solution is not as robust as a ring beam, which secures all four outer walls, but it is nonetheless a dramatic improvement on a stand-alone structure. This may also help explain why the construction of buildings around a square originated, as it avoids having a vulnerable last wall. (See Fig. 3 and Fig 4). 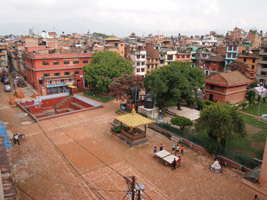 If one accepts that this technique of building in densely packed settlements, and small squares in particular, provides added structural reinforcement, it is then a small step to large squares, such as Nag Bahal in Lalitpur (see photos below) and to some of the exquisite sattals of the historic Newar settlements. Moreover, we begin to understand the use of small squares as reinforcing structures in the corners of larger squares (akin to buttressing). In sum, this paper postulates that given the greatly reduced risk from earthquakes, Newars increasingly moved from stand-alone, single-storey structures to houses that were joined together in ever increasing complexity such that stand-alone, single family buildings evolved into one large structure comprising many family units. However, over time such quadrangle construction could not address the problem of additional space for expanding households, the division of property amongst brothers and extended families and the demand for more living space. There was no alternative but to build upwards – and the result is an extraordinary, multi-storied, urban landscape with immense character and charm. Unfortunately, following the 2015 earthquakes, this uniquely beautiful urban form is under threat. Municipal engineers are currently using all available guidelines for assessment to determine which houses should be demolished. Unfortunately, these guidelines assess individual units (i.e. family living spaces) as single structures. 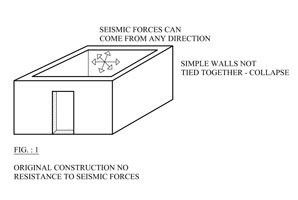 The problem with this is that without seismic joints separating the living units all the interconnected living units are in effect one single giant structure. Following the theory put forth above, these units being a single structure should be assessed as such before condemning any part of them. Most guidelines are disingenuous here, both in damage assessment and building permits, perhaps deliberately so, which leads to liability, lawyers and litigation. The experience of Christchurch, New Zealand is a salutary lesson here where, 5 years after devastating earthquakes, no reconstruction has taken place and displaced people are still living in containers. The immediate lesson from the 2015 earthquakes is the importance of maintenance to these old urban settlements. Visual inspection shows many of the ground floors have damp brickwork which significantly reduces the strength of these huge structures where it is most needed. Damp due to poorly maintained drainage networks seeps upwards and the bricks crumble, as will the house. Rotting timbers also need replacing. 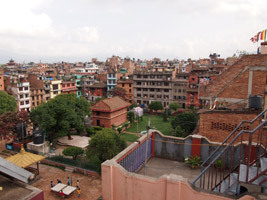 The effects of the lack of maintenance is well demonstrated by the differing performance of the various urban centres in the Kathmandu Valley: apart from the temple core areas, Kathmandu and Lalitpur were relatively unscathed whilst some areas of Bhaktapur which had not been lived in for many years suffered badly; the much smaller and remoter core areas of Sankhu and Bungamati were far more affected. 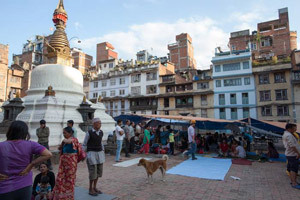 Why this was so requires further investigation but it is likely to include poor soils (Sankhu is not on higher ground and the soils are likely to be more vulnerable clays), migration to Kathmandu and using urban space to construct more modern houses (an option not available to residents of the Kathmandu and Lalitpur urban cores). Taking this approach of assessing entire blocks of interconnected houses rather than individual units and then looking at damage in the ground floors, which are essentially damp and low strength brick, allows an approach to strengthening which is more akin to mundane maintenance activities, avoiding the heavy costs of strengthening or completely rebuilding as seems to be the bureaucratic, guideline driven intent at present. It goes without saying that contemporary seismic engineering techniques may be useful to complement traditional Newar design in some instances (note the new, reinforced concrete frame structures in the Bahal photographs); introducing modern techniques is just another evolutionary step. However, these are extraordinary structures which have evolved over time specifically in response to an ever present hazard. They have survived relatively well and, with active maintenance, should survive long into the future. This table shows that no historic earthquake has Kathmandu as epicenter, and attempts to determine a return period for such events in the valley are seriously complicated by the location and nature of the events themselves. The 1934 earthquake was centered in Bihar on the Indian tectonic plate whereas the April 2015 event was centered in Lamjung, NW of Kathmandu, in the same rupture zone on the Eurasian plate as the 1833 event (NSC/ Roger Bilham 1995 and personal communication May 2015); Eastern Nepal and the Kathmandu valley have been hit by earthquakes centered in Assam and Bhutan. Of particular concern for the future is the central Himalayan gap which runs from Pokhara westwards to Dehra Dhun in India where there has been no major release of energy along the fault line since 1505; the estimated slip required to release this energy buildup from the Indian plate subducting the Eurasian plate is of the order of 9 meters. Unfortunately this gap is unique across the entire Himalayan region from NE India Burma west to Pakistan and beyond. Meryl Dowman has a post graduate degree in Fine Arts from the Royal Academy Schools in London. She is a writer, author and painter and has lived in the Himalayas for more than four decades. Special thanks are extended to Dale and Christopher Davis of the Bhani Mandal seminar group for their invaluable input on this subject, indeed for sowing the seeds of this concept.